Upgraded on Dec. 5, 2018 with Thicker Stronger Long Arm/Neck. Perfect Truck Phone Mount, securely smartphone close to your fingers and sight. Design With clamp and extremely strong suction cup with very steady support base. Compatible Enough. X Clamp fits almost all phones with phone case Spigen case/Loopy case/wallet phone case/ring holder, double clips can be expanded up to max 3. 54inches. Upgraded 3M Adhesive Dashboard Base Design. Extra sponge dashboard base offers extra stability and security, never got distracted while on the road. Reusable. Strong suction cup is easy to clean and recover stickiness. 360 Degree Rotation. Hold your phone in perfect angle. The IPOW Car Clamp will work perfectly with: Apple iPhone 6/5S/5C/5/4S/4, iPhone 6plus, Samsung Galaxy S5/S4/S3, Google Android Nexus 7/6/5/4, HTC Desire, LG Optimus, Motorola Moto X, Nokia Lumia, Blackberry,Sony Xperia, Virtually any smartphones/tablets and 3.2~6.0 inches phone screen,it works perfectly with this Car Mount System. 1.Perfectly Fits any Mobile Phone and Electrical Device diagonal screen from 3.2 inches to 6.0 inches. 2.Design with a super strong sticky gel pad which will stick securely to most smooth flat surfaces, and yet is still easily removable. 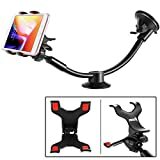 3.With beautiful long arm design and extra dashboard support base, our Car Mount will help secure your smartphone or tablet device while allowing you to drive without distraction. 4.With a adjustable X clamp to fit almost phones on the market. 5.360 Swivel to find Your perfect tilt,shockproof cd slot blade to insert in any cd slot.The screw will help you to fit the cd slot more easier. We provide best after-sales customer service for you,if not satisfy with it,please feel free to contact us,IPOW will be always reply you within 24 hours.Don’t hesitate,just take it home!